The global cancer landscape is not only complex, but also is constantly changing. Shifting demographics and health behaviors, as well as evolving levels of economic development, are reshaping the cancer burden worldwide. This is one of the key takeaways from the just-released book, The Cancer Atlas, Second Edition, and accompanying website produced by the American Cancer Society, the International Agency for Research on Cancer, and the Union for International Cancer Control. The challenge is for global cancer leaders to better understand the specifics of the cancer burden their country faces and then implement the most applicable prevention, detection, and treatment strategies. While every nation is different, there is much that countries can learn from one another. This is the type of information that leaders can get from the Cancer Atlas. In this interview, Cancer Atlas author and editor Ahmedin Jemal of the American Cancer Society discusses how the cancer landscape has changed and what more leaders can do to reduce the burden. Q. This is the second edition of The Cancer Atlas. The first edition came out in 2006. What have been some of the most significant shifts in the cancer landscape since that time? A. The burden of cancer continues to shift from high-income countries to low- and middle- income countries because of increases in the prevalence of known cancer risk factors such as smoking, physical inactivity, poor diet, and reproductive behaviors, as well as increases in life expectancy and growth of the population. Q. While much has changed since 2006, a lot has stayed the same – both in terms of the cancer burden and also in regard to actions that countries could take to better prevent and treat cancer. In what areas of the world has there been the least progress? And, which cancer prevention and treatment tactics have countries made the least strides on? A. Although there has not been optimal application of any known interventions to reduce the suffering and deaths from cancer, even in high-income countries such as the United States, the least progress has been made in making treatment (surgery, radiotherapy, chemotherapy) accessible to millions of patients in low- and middle- income countries, especially in Africa and most parts of Latin America and Asia. Q. As outlined in the Cancer Atlas, there is significant geographic variation in the cancer burden. What factors contribute to the differences in cancer incidence and mortality that you find across the globe? A. The variations in the cancer burden across countries are largely due to differences in prevalence of known risk factors as well as availability of early detection and treatment services. For example, lung cancer rates are much higher in North America, Europe, and Australia than in Asia and Africa because of the historically high prevalence of smoking in the former countries. In contrast, liver cancer rates are highest in China and parts of sub-Saharan Africa because of the high prevalence of Hepatitis B virus infection in these regions. Cervical cancer incidence rates are highest in sub-Saharan Africa and parts of South America because of lack of screening. Q. What finding was most surprising to you in putting together the Cancer Atlas? A. To me, the most surprising finding is the large magnitude of inequalities in access to primary prevention, early detection, treatment, and palliative care (pain control) across countries. For example, about 6 in 10 cancer patients benefit from radiotherapy at one point during their course of treatment. However, this life-saving therapy is not accessible for the majority of cancer patients worldwide. 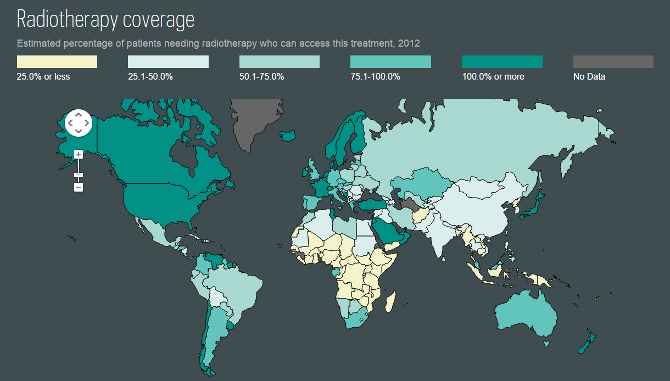 In particular, 20 countries in sub-Saharan Africa do not even have a single radiotherapy facility. Q. What, for you, are the key takeaways from the Cancer Atlas? A. We know so much about how to prevent and control cancer, but we do little to apply this knowledge across all populations and countries. Q. What are the most important actions governments can take to address the global cancer burden? A. The most important actions that governments can take to address the cancer burden include creating policies that promote healthy behaviors (e.g., raising price of cigarettes and implementing smoke-free air laws) and ensuring everyone has access to care, and implementing comprehensive cancer prevention and control programs.